Last Monday I shared a Spotlight on Mom post featuring Allison Brush-Stern , creator of Collapse-A-Pail, that collapses for easy storage in beach bags, totes, etc. If you missed my interview with Allison, click here to read it now -- http://www.inspiredbysavannah.com/2014/03/spotlight-on-mom-allison-brush-stern.html. Flat-out the most portable sand pail ever! 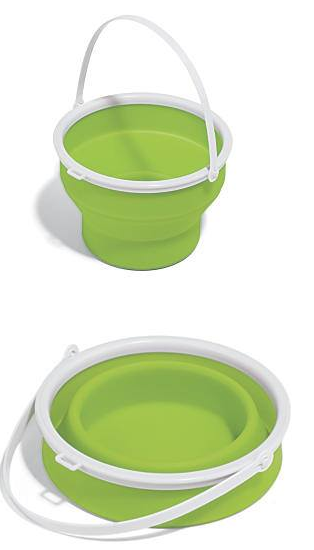 This flexible, silicone sand pail collapses to just 2" H, so it's a breeze to bring along. Frees up space in your beach bag, suitcase, and off-season, your garage. Kids find it fascinating; the collapsible bucket is sturdy enough to tote sand, water, and even snow. Measures 7" in diameter x 5" H open; just press down on the rim to collapse to 2" H. For ages 3 and up. While it is not beach weather here yet in New England....we just had snow yesterday, even though we are in spring...my girls and I are eagerly awaiting the nice weather so that we can get outdoors and really try out the Collapse-A-Pail. 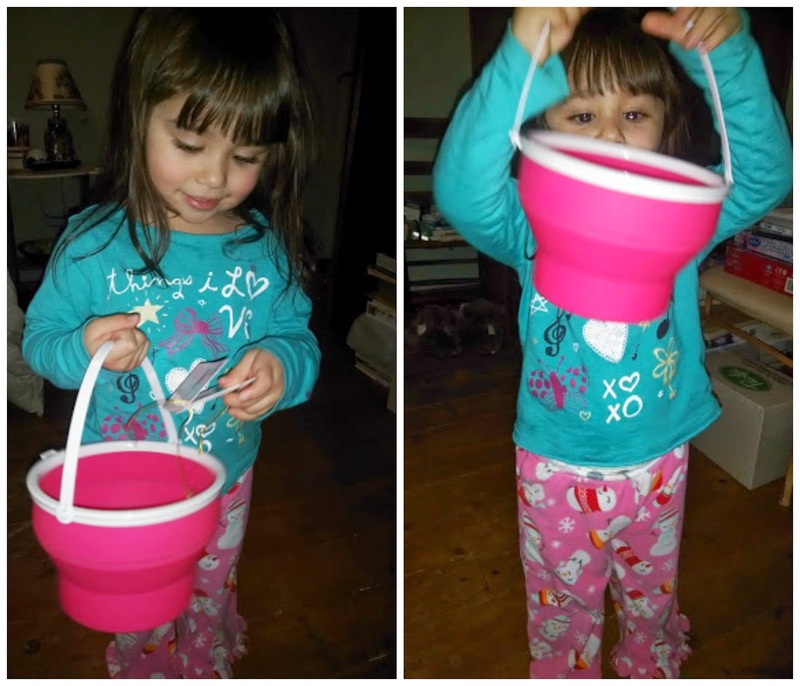 In the meantime, Savannah has been enjoying use this mom-invented sand pail to collect Easter eggs we have been leaving around the house, as she practices and hones her egg hunting skills for the upcoming egg hunts. And, when she is not collecting eggs, she loves to pill the pail with some of her favorite My Little Pony toys. While I don't hope for any more substantial snow for Savannah to try out the snow castle idea, I will keep this in mind for next winter. I know that once the warmer is here to stay that we will be filling out daughters' sand box in the back yard, and their Collapse-A-Pail will be front and center. From transporting dirt from one spot of the sand box to another, to making mud pies or sand castles, the collapsible pail will definitely come in handy. So many ways to use this versatile and oh so colorful sand pail. But, I have to say the best part of this mom-invented product is how it collapses and can be stored quickly and easily, without taking up much room. Good luck at trying to fit a few plastic sand pails in a beach tote or suitcase for that matter. No can do. But, with the Collapse-A-Pail, you can bring all the beach necessities with you on your next vacation and not have to worry about buying a sand pail once you reach your vacation destination or day out at the beach because you couldn't fit it in your bag. Once you try out the Collapse-A-Pail for yourself, you will wonder how your family ever lived without this unique invention. So, what are you waiting for? 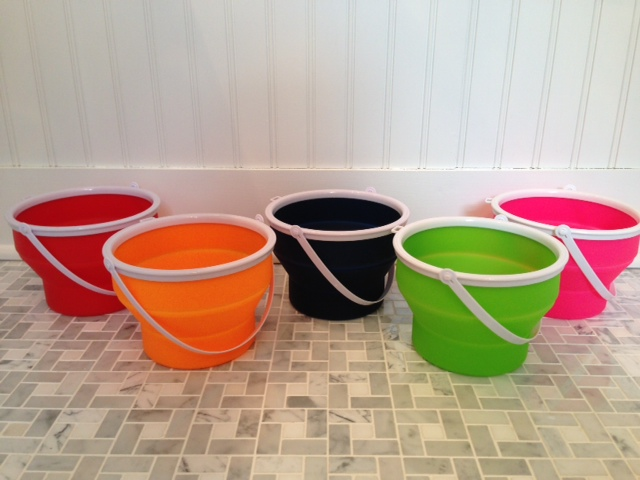 Head on over to Allison's website to order your own Collapse-A-Pail for only $12.95 each -- http://www.collapseapail.com/. Allison was kind enough to offer one lucky reader the chance to win their very own Collapse-A-Pail. To enter, please complete the entries on the Rafflecopter form below. Good luck! Very ingenious! I would love to surprise my grandson with a Collapse-A-Pail.